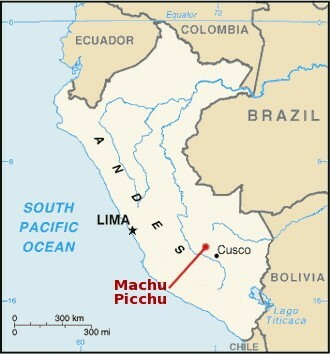 Located at 120 kms to the northwest of Cuzco on the valley of the Urubamba River (name given to the Vilcanota River in this area), within the mountain of Vilcabamba, the Inca citadel of Machu Picchu constitutes one of the most important archaeological sites in the world, and Peru’s main tourist destination. Few things made by humans maintain such harmony with its natural surrondings and adjacent archaeological groups. Machu Picchu is located at 2.400 masl (7.874 fasl), on the top of the plateau located between two peaks. From these two, the smallest,the Huayna Picchu is the one that defines the topography of the site. The archaeological site is strategically located on the peak of the Machu Picchu Mountain (quechua name for “old major mountain”) that gives the name to the citadel and the spectacular setting we all have seen in photographs. Facing this mountain is the Huayna Picchu (young mountain) where it is also possible to find archaeological remains on its peak. Both peaks are surrounded by the mighty Urubamba River, which runs east through the canyon almost half a mile below the citadel. The constructions were built harmoniously on the narrow and uneven surface of a cliff surrounded by the precipices of the imposing Urubamba Canyon, where 400 meters below, the river roars and meanders. As centuries went by the original name of the ruins fell into oblivion. In fact, Machu Picchu is just a topographic denomination that means “Old Mountain”, while the Huayna Picchu means “Young Mountain”. In this case the translation must keep a correlation with the concept of volume so as to mean “major summit” and “minor summit” respectively. Ever since its discovery in 1911, Machu Picchu has been a true and insoluble archaeological enigma. Even nowadays scholars are intrigued by its history and function, and it is possible that these mysteries will never be totally unraveled.